January 11: Allied airplanes bombard the harbour of Piraeus, destroying much of the city centre and killing 5,500 civilians. January 21: Four units of the Hellenic Navy ("Crete", "Themistocles", "Chios" and "Samos") take part in the landing at Anzio. January 26: 43 Greeks are executed outside Kozani by the occupation forces. February 12: The Norwegian steamship "Oria" sinks off the coast of Patroklos island, causing the death of 4,095 Italian prisoners of war, 21 Greeks and 15 Germans. This is the worst maritime disaster in the Mediterranean Sea. February 29: Greek resistance movements EDES, EAM and EKKA sign a cooperation pact at Plaka, Epirus. March 10: The Political Committee of National Liberation (the "government of the mountains") is formed at Viniani, Evritania prefecture. Evripidis Bakirtzis is sworn in as Prime Minister. March 30: Warrant Officer, Sotiris Skantzikas, is one of 50 POWs executed by the Germans after "The Great Escape" from Stalag Luft III. April 1: Leftist officers and troops of the Greek 1st Brigade revolt in Alexandria. April 3: 30 Greeks, under Lt. Col. Andreas Kalinskis, liberate Greek prisoners held by the Germans in Mytilene. Six Germans are killed in the operation. April 4: The village of Drosopigi in Florina prefecture, Macedonia, Greece, is totally destroyed by German occupation troops. April 5: 270 Greeks are executed in the village of Kleisoura (Kastoria), by the German occupation forces, in retaliation for the killing of two German soldiers in the area. April 5: Hellenic Navy crew members join the revolt in Alexandria. April 17: Communist resistance group ELAS attack and annihilate EKKA, a republican resistance group. EKKA leader, Dimitrios Psaros, is captured and executed. April 18: Alexandros Svolos replaces Evripidis Bakirtzis as head of the Political Committee of National Liberation (the government of the mountains). April 23: The revolt of Greek leftist troops in Alexandria is put down by force. April 24: 318 Greeks are killed by German occupation troops in Pyrgos, Kozani prefecture. 180 of them were burned alive. April 26: Greek guerrilas and British commandos kidnap Gen. Heinrich Kreipe, commander of the German garrison of Crete. May 1: 200 Greek patriots are executed by the Nazis at Kaisariani. May 4: The village of Saktouria in Rethymno prefecture, Crete, is totally destroyed by German occupation troops. May 4: The village of Margarikari in Heraklio prefecture, Crete, is totally destroyed by German occupation troops. May 9: 10 Greeks are hanged by the German occupation forces at Psila Alonia, Achaea prefecture. Several were members of the resistance group EAM. May 16: Sixteen inhabitants of the village of Saktouria in Rethymno prefecture, Crete, are executed by German occupation troops. May 17: The Greek government-in-exile meets with representatives of the various guerrila movements in Lebanon. June 10: German occupation troops execute 218 Greeks in Distomo, Boeotia prefecture. June 17: German occupation troops destroy Ypati, Phthiotis prefecture after executing 28 inhabitants. July 11: Lela Karayianni, leader of resistance group "Bouboulina" is captured by the Germans. August 11: The Greek 3rd mountain brigade lands in Taranto, Italy. August 13: German troops destroy the village of Anogia, Crete. August 17: German troops execute 148 Greeks in Kokkinia, Piraeus. August 21: German troops destroy the village of Damasta, Crete, after executing 30 inhabitants. September 5: 50 Greeks are executed at Kesariani by German occupation troops. September 8: Lela Karayianni, leader of the "Bouboulina" resistance movement, is executed by the Germans. September 14: German forces execute 114 residents of Giannitsa. September 15: ELAS guerrilas attack and capture Meligala, Messinia. Atrocities follow with as many as 1,450 dead. September 21: The Greek 3rd mountain brigade enters Rimini after defeating its German defenders. September 26: EAM/ELAS and EDES agree in Caserta, Italy, to place their men under the command of British Maj. Gen. Ronald Skobie. September 27: The Greek 3rd mountain brigade crosses the Rubicon. October 7: 300 Greek Jews lead 150 others in a revolt at the Auschwitz concentration camp. Nearly all are killed in the ensuing fight against the German guards. October 7: The first British troops land in the Peloponnese. 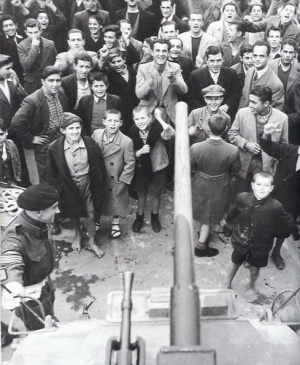 October 12: The WWII German occupying forces move out of Athens. October 17: The Greek government-in-exile boards the Battleship Georgios Averof for the return trip to Athens. October 18: The Greek Government in exile, under Georgios Papandreou, arrives in Piraeus. October 20: Joseph Stalin and Sir Winston Churchill partition eastern Europe into "spheres of influence". Greece is marked as 90% under British and only 10% under Soviet influence. October 28: German soldiers, while on retreat, sabotage and destroy the bridge of Papadia, and the tunnel and bridge of Brallos. November 3: A 100 billion drachma note is put into circulation - the largest denomination of currency ever issued in Greece. November 28: PM Georgios Papandreou calls for the dissolution of all guerrila movements by December 10. December 1: Gen. Ronald Scobie issues a proclamation calling for the dissolution of the National Popular Liberation Army (ELAS). His call will go unheeded. December 2: Five leftist Ministers of the Papandreou government resign in protest at Gen. Scobie's call for the dissolution of the National Popular Liberation Army (ELAS). December 3: Members and supporters of the leftist EAM/ELAS demonstrate in Constitution Square, Athens. Police fire on the demonstrators killing 28 of them. December 4: Communist organisation ELAS and nationalist Organisation X battle at Theseum for control of Athens. December 21: Three ELAS divisions attack EDES at their stronghold in Epirus. December 22: The High Command of EDES orders its forces to retreat to Preveza. December 24: Sir Winston Churchill arrives in Athens in an attempt to resolve the political crisis between EAM and the re-instated Greek government of Georgios Papandreou. December 27: PM Georgios Papandreou submits his resignation in the midst of the post-World War II December crisis ("Δεκεμβριανά"). Winston Churchill leaves Athens for London. December 28: British ships start to evacuate the remnants of Napoleon Zervas' EDES forces off the Greek mainland to the island of Corfu. December 30: Epirus comes under the full control of ELAS. June 21: Corinna Tsopei, Miss Universe of 1964. November 12: Tellos Agras, poet. December 3: Prince Andrew of Greece, in Monaco where he had been exiled. This page was last edited on January 19, 2019, at 20:47.